Whether you’re wanting a general fixed blade utility knife that excels at clearing brush, chopping firewood, skinning animals and opening cans, or a kukri that will best an opponent in hand-to-hand combat, I’ve got you covered. Sourced from some of the best kukri brands, you’ll only find the best of the best here. 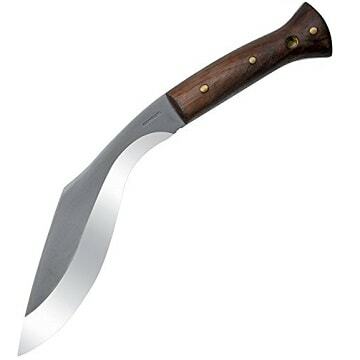 is a great flat-grind kukri that mixes the best of machetes and kukris into one reliable tool. Plus, it’s made in the USA and comes with a limited lifetime warranty, making it a quality tool that you can trust to last a lifetime. Great for Chopping, Slashing and Hacking – The flat grind helps this kukri chop and slash through vegetation, vines and other materials with ease. While the flat grind isn’t as great for splitting wood, you can still baton wood to split it without much issue. The durable high-carbon steel blade will keep its edge great over time while still being easy to sharpen. A black finish protects the blade from rust, which is nice bonus since carbon steel is more prone to corroding. Durable Full-Tang Blade Construction – This kukri has a full tang blade ] that extends through the handle. This improves the durability as well as the balance of the knife, making it easier to swing, chop and slash with. Looking at the handle, you’ll find durable G-10 with finger grooves for a secure grip. Great for Hiking and Camping – If you’re wanting to backpack, hike or camp with this kukri, you’ll also be pleased to know that while it is larger than a typical bushcraft knife, it’s lightweight and nimble at 1.1lbs. Carrying this kukri is also made easier with the included nylon snap sheath a belt loop for optional hip carry. Overall, this is a great all-around kukri that mixes the best of kukris and machetes into one knife. The sharp 12-inch blade can handle tough campsite jobs like clearing brush and batoning wood, while also being great for general yard and field work. Whether you’re wanting a kukri to use for survival, bushcraft, or even simply a tool for work around the yard, this USA made quality tool can get the job done. Condor Kukri is a tool that packs serious power. This survival knife can cut, chop and slash through tough brush, trees and logs with ease. Heavy-Duty, But Not too Heavy – It gets its heavy-duty label from its heavyweight of 1.82lbs, but don’t let this mislead you. This kukri doesn’t feel unwieldy or too heavy, its got a great balance that comes from its full-tang design. This kukri also has an excellent kukri bend in the blade along with a sharp edge that extends all the way to the base of the blade, making it great for chopping anything that comes in your way. Built to Last – Durable tempered 1075 high-carbon steel is used for the blade, making it great for tough high-impact jobs like splitting and batoning wood. If you’re a fan of bushcraft, you’ll appreciate how this knife can potentially replace both your bushcraft knife and bushcraft hatchet with its versatile and powerful blade. Another feature that keeps this blade free from rust is the blasted satin blade finish that steals the non-exposed steel from moisture and corrosion. While you’ll still need to oil occasionally oil the blade to prevent rust, it’s a nice feature that helps keep this kukri low-maintenance. A Rare Issue, and How to Fix It – Some people have reported issues of the blade edge coming with a convex grind instead of a flat grind, hindering its ability to chop and slash through vegetation like a machete. Although it seems to be a rare issue, a few passes with a rat file over the blade edge should fix it. Great Quality Grip – You may have noticed the beautiful hardwood grip with its great finish. You’ll be pleased to know that it’s as comfortable as it is beautiful, giving you a great grip to control the kukri with. 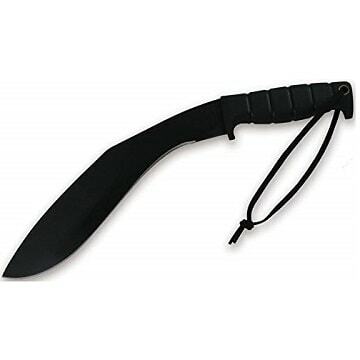 Included Black Leather Sheath – Also included with this kukri is a basic black leather sheath that makes carrying it when hiking, backpacking or during bushcraft easier. They’ve slowly improved the quality of this sheath over time, with these kukris now coming with a very capable sheath that will serve you well. Overall, this is a great kukri for anyone who wants a heavy-duty tool that can do it all. From chopping and slashing brush and vines, to a hunting knife useful for skinning animals and even splitting kindling for a fire, this kukri can do it all. It’s a great choice for bushcraft, backpacking, camping, hiking and self-defense making it one of the overall best kukris for the money. If you’re wanting one of the best real deal kukris out there, this genuine Gurkha kukri may be the tool for you. These kukris are made by the real Gurkha that used to supply kukris to Nepal but have since moved into the commercial market. Powerful Kukri Blade – Starting with the blade, this kukri has a full-tang blade that goes through the handle for better balance and durability during tough chopping. Its large and powerful 10-inch blade can handle tough jobs around the campsite and along the trails. Whether it’s skinning animals, clearing heavy brush, or chopping and baton firewood, this kukri is a tool you can trust to get the job done. In classic fashion, this kukri is also great as a self-defense weapon. You can dish out some serious damage with powerful chops and slashes. Quick Tips to Improve Your Mileage – This Gurkha kukri is made with high-carbon steel which gives it a sharp, long-lasting edge. One downside of this though is that you’ll need to regularly oil the steel, and it’s recommend you do it after every outing. If you oil your blade, it should be rust free and stay sharper longer. Another thing you can do to help prevent rust and protect the steel of this kukri is to polish it once you get it. The blade comes unpolished but rubbing it down with some knife polish and a clean rag should seal the steel and protect it from getting pits and pores. Comfortable and Practical Grip – The rosewood handle comes polished and sealed with a great smooth finish. Finger grooves help this tool firmly stick in your hand even during heavy chopping in wet conditions. About the Scabbard… – One aspect I was disappointed about with this Gurkha kukri was the scabbard. I would’ve expected better, but I guess it works alright. You’ll find the scabbard’s leather is a bit dry and has been loosely constructed. It seems like it was an afterthought when compared to the quality of the kukri itself. If you want a serious sheath, I recommend you find somebody that can make you a snap-sheath from leather or kydex. Or if you’re more handy and inclined, you could even try making one yourself. Overall this Gurkha kukri is an excellent tool and one of the best real-deal Gurkha kukris. I’d say it’s 95% of the way to be the perfect Gurkha kukri. The other 5% comes from polishing and oiling the steel when you get this knife, as well as sourcing out a better sheath for it. If you want one of the best Gurkha kukris, I’d recommend you check out this excellent tool. Versatile and Powerful Blade – Starting with the blade, this kukri combines elements that strike a great balance between traditional kukri and machetes. The blade has a kukri-shaped blade but sports a machete flat grind that makes it perfect for clearing bush, chopping vines, skinning animals and defending yourself with. The blade is full tang into the handle, giving it good balance and making this light and nimble kukri swing easier. Depending on your view, the lightweight may be either an advantage or disadvantage. This kukri only weighs 1lb, making it easy to carry when backpacking or hiking along the trails. But if you’re wanting to do heavy-duty work like split kindling for a campfire, you might want to try a different kukri. I will say that while this kukri isn’t too great at splitting wood, you can still use it to baton wood with, achieving the same result, just using bushcraft skills instead. Includes Cor-Ex Fitted Sheath – To help you carry this lightweight kukri, Cold Steel includes a Cor-Ex form fitted sheath. This sheath slips right over the blade, making it easier to carry while protecting it from dirt, damage and rust. The sheath itself is also lightweight, making it easy to take this kukri camping, hiking, and backpacking. It is hands down one of the best cheap kukris on the market. It doesn’t sacrifice quality and strikes a unique and effective balance between kukri and machete designs. Whether you’re wanting to camp, backpack, bushcraft, do yard work or even use this kukri for self-defense, this knife offers something for everybody. If you’re wanting the best cheap kukri, I recommend you check out this kukri. Ka-bar Kukri mixes traditional and non-traditional aspects to make a whopper that packs enough power to handle tough campsite brush, wood splitting, and bushcraft. Powerful 12-Inch Blade Handles Tough Jobs – The sharp 12-inch blade can chop, slice and lash through most anything in your way without much difficulty. While the blade angle isn’t as curved as a traditional kukri, it still has great balance and power. Its chopping ability is still just as good as you would expect from any other kukri. Rust-Resistant Black Coating – A black coating covers the steel to protect it from rust and corrosion. I think the coating could be a bit better, as some tends to chip off near the edge when you’re hacking away. It isn’t too much of an issue however as its mostly cosmetics and has no impact on performance. Durable Kraton Handle – A kraton handle provides a great grip that is molded to fit nicely in your hand. There’s also ridges to help the kukri stay firmly planted in your hand with no chance of slipping forwards or backwards while remaining comfortable to use. Included Snap-Sheath – Included with this kukri is a synthetic snap-sheath that protects and secures the blade with no chance of the knife accidentally falling out. On the end of the sheath is also a d-ring that helps it hang freely if you choose, making it less clunky and awkward to carry. Overall, KA-BARS kukri knife is a good mid-range tool that can handle anything from splitting kindling for a fire to precise skinning jobs and even self-defense scenarios. It’s a dependable, rugged and reliable blade that serves as a good all-around kukri with few downsides.